Friday Sept 6th Shifted out of old camp to W Lines. 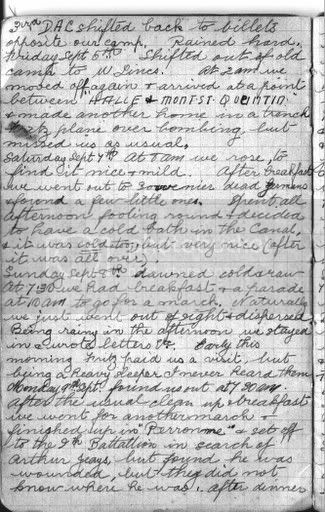 At 2am we moved off again & arrived at a point between HALLE and MONT ST QUENTIN & made another home in a trench. Fritz plane over bombing, but missed us as usual. Wednesday Sept 6th started off cloudy. The car to the workshop today, as there appears to be problems with the cooling system; boiled madly on the way back from the office yesterday afternoon. So, working from home today. Also did a bit of carpentry, finishing off the larger bench stool requested by Mrs D. Turned out OK, too. Just needs varnishing now.